It’s been a while since I played – I forgot to reset my planetary interaction last week. Oh well. Aurora is nearing 32 million skill points, so her Xi clone wouldn’t be good for much longer. Thus I swapped into the Buzzard and started the scan procedure for hisec, in order to get to a station and run these errands. But first, I checked the corporate bookmarks and it looked like there was a pair of current entries: the N110 to hisec and the K162 back home. I decided to give them a try since it would save me 5-10 minutes and maybe even more. After a quick d-scan to make sure nothing unusual was around, I took a risk and jumped 0 km to the N110. And it was there, so I passed through and found myself in Jouvulen (which I already knew from the K162 bookmark info). This meant the closest trade hub was good old Jita. Well, it isn’t too bad unless there is some “Burn Jita” event going on ;). Once in Jita, with a nice eventless trip, I docked up and did a bit of shopping: various skills and a clone upgrade. My skill queue is a mix of missiles, electronic warfare, logistics, and drones and it is lengthy as well – 295 days. I’m sure 2 months from now I’ll juggle stuff around, adding and subtracting skills, so what is there right now will change drastically. 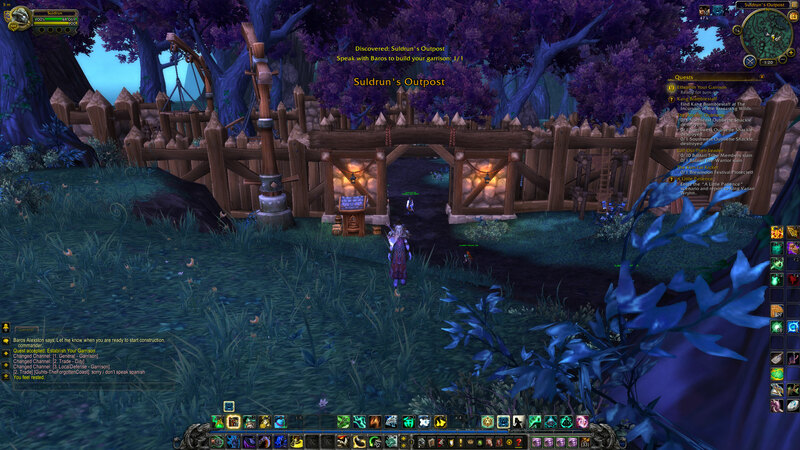 Suldrun is level 98 now, with a Level 2 Garrison and various level 2 buildings. So far, I am enjoying running the Garrison. It generates 30 mins to 1 hour of stuff to do each day, and provides me some tangible benefits. It produces resources, so pick them up after logging in. Then I’ll wander into my town hall and check on any completed missions (that I sent my followers on). The mission rewards are typically experience (for the followers), gold, garrison resources, or sometimes items – but I haven’t completed one of those yet out of two I’ve tried. The first one I failed because I misunderstood the mission obstacle – I didn’t send followers that could counter all the obstacles. Doh! The second one I failed due to bad luck – I had countered the obstacles, but due to the level of the challenge versus the level of my followers, there was just a 67%, and I was not lucky that time. I swing by my alchemy lab and sometimes a follower I assigned produces an extra item for me to pick up. While I do appreciate the items that Bruna Swiftstone generates, I might take her off alchemy duty because she’s my only follower (right now) that can counter Minion Swarms and I need her available for missions. Plus she needs to level up! After that I’ll go outside the wall to the herb garden, pick up any previous work orders, and harvest whatever is there. Sometimes a single enemy spawns so I’ll have a quick fight. The garden is nice because Suldrun is an alchemist/herbalist, so I can use what I harvest to skill up. I’ll check with the gardener and send in some work orders if I have enough Draenic Seeds. I’ll then zip over to the excavation, pick up any previous work orders, and descend into the mine and harvest all the available ore. Even though Suldrun isn’t a miner, I can mine the nodes that appear in the excavation. 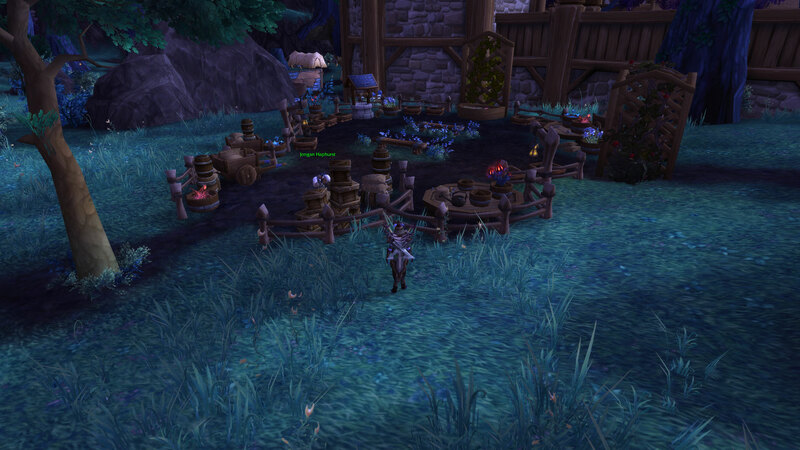 I’m assuming that non-herbalists can similarly pick from the herb garden. 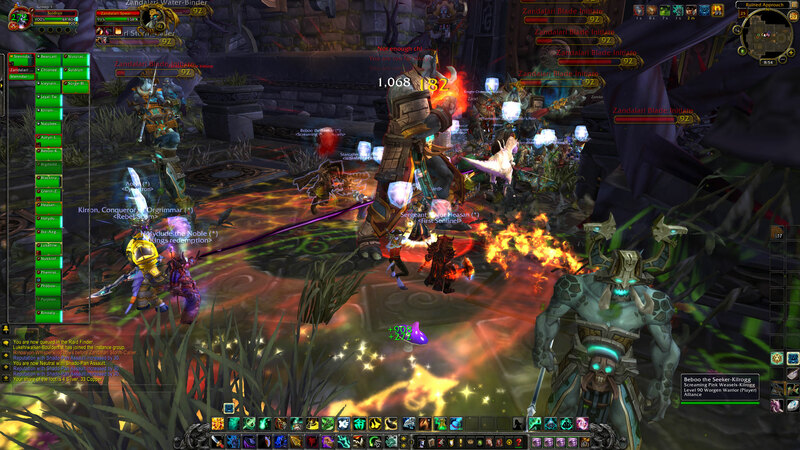 I’ve had a single mob spawn here as well, so sometimes there is a quick fight too. Once outside, I’ll check with the foreman and send in work orders if I have enough Draenic Stone. Sometimes I fish but not always. It is kinda dull and the only reason I do it is for cooking, which isn’t too exciting BUT cooking provides huge benefits via food that heals giant amounts of health/mana. I did one daily quest about getting fish eggs, and wondered what to do with the leftover meat. I looked through the Draenic cooking section and saw that I could make food that healed 170K health over 20 seconds (?!) 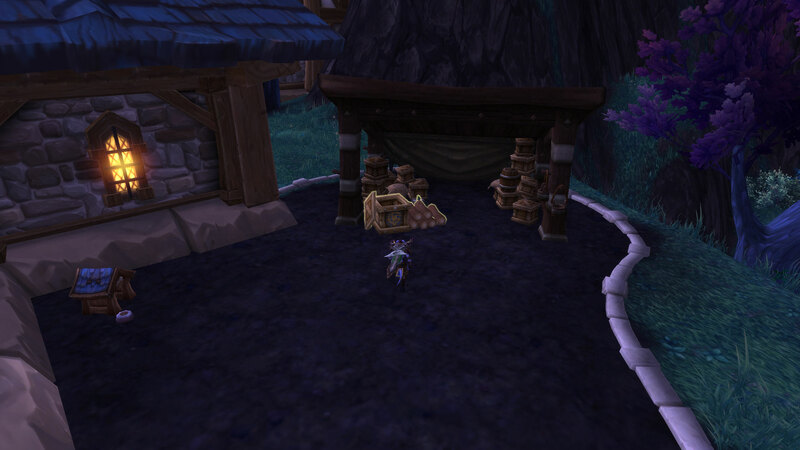 so I tossed out all the meals I made skilling up in Pandaria and made a bunch of the new foods which are hugely better. 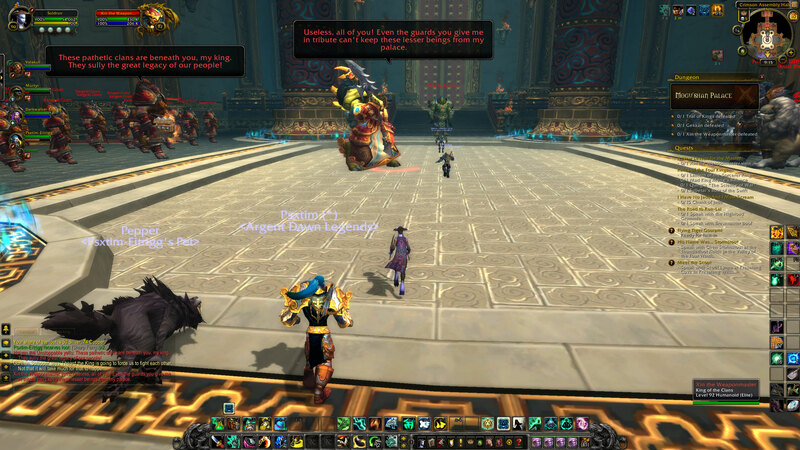 But of course they need to be because the level cap in MoP was 90 and now it is 100. Anyway, what was even nicer is I received more recipes while my cooking skill climbed. I also have my own Bank, Lunarfall Inn, and Dwarven Bunker (various building options I chose). Like everyone else, I have my own flight master. 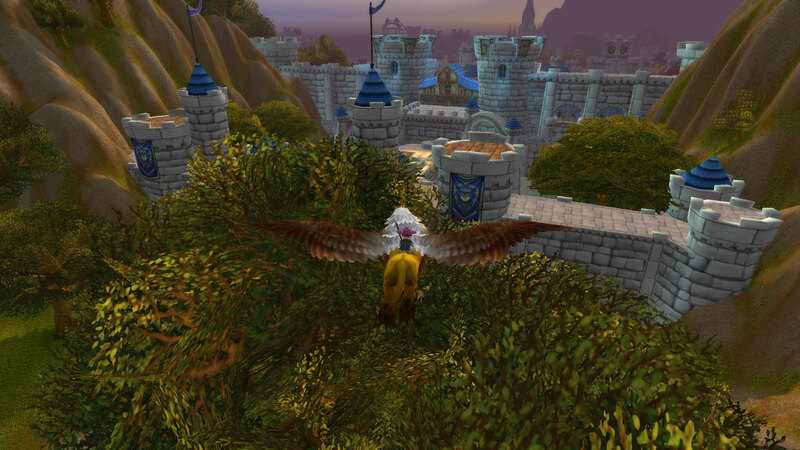 And then when I’m ready, I’ll fly off to a quest hub and work on various quests or the storyline more. Before logging off, I’ll check available missions and send followers out on any that look good. I like this system a lot since it provides some useful benefits. 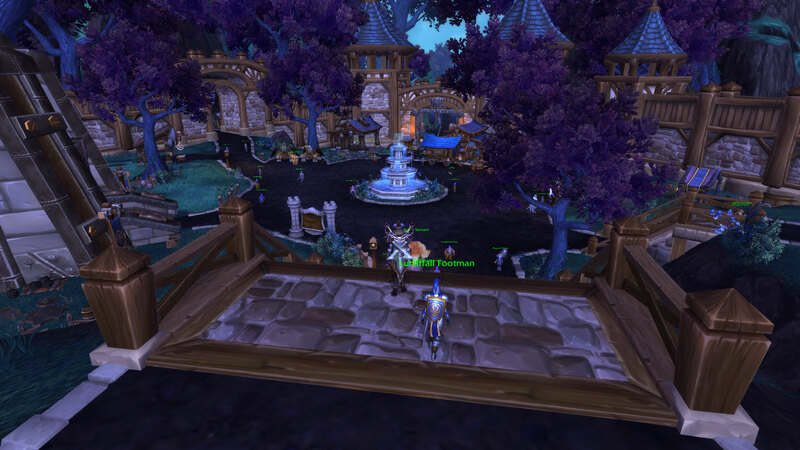 I can fiddle around a bit and essentially gather several resources in the garrison instance in peace – I also gather while questing but the garrison is a nice supplement. Sending followers off on mission is a little mini-game that scores me some gold once in a while, more or less trades garrison resources for gold. Or, gets me bonus garrison resources… the typical mission just gets experience for the followers I sent on it. I can fish and cook right near the fish shack, and on a PvP world it is handy having food around – after some fights I need to heal up and it isn’t too wise to wait for natural regen or blow all your energy casting healing spells. There is still plenty of player interaction – I keep chat open and a steady stream of messages scroll by. That of course is a minor issue given I have several RL friends playing so chat with friends, guild chat, and queueing for instances provides plenty of player interaction even tucked away in my garrison instance. And of course having that 2nd hearthstone is extremely convenient! I realize that my garrison is essentially a clone of every other player’s garrison; the differences being what buildings they choose and the upgrade level of those buildings. There aren’t decoration options available, which I know many players enjoy. But while I had fun decorating my house in LoTRO, I don’t really use it except for the extra storage. And to listen to the awesome background music I have playing when I’m there ;). But I visit so rarely I forget I have a house so it is good thing I pay the upkeep fee 3+ months in advance. 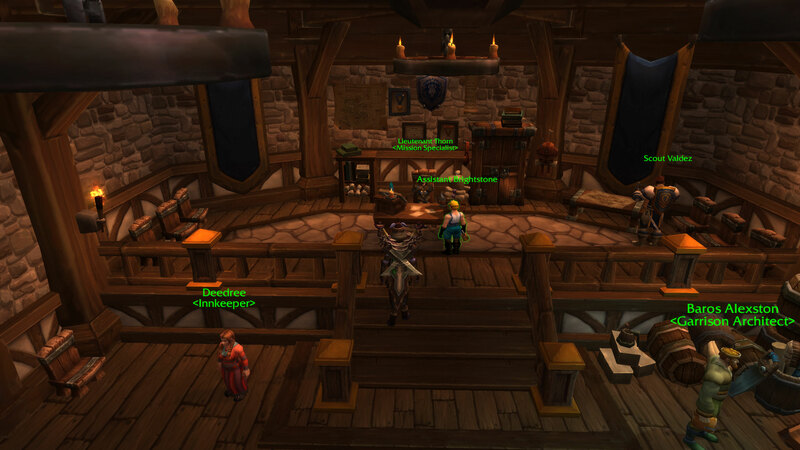 What the WoW garrison lacks in customization it makes up for in usefulness. 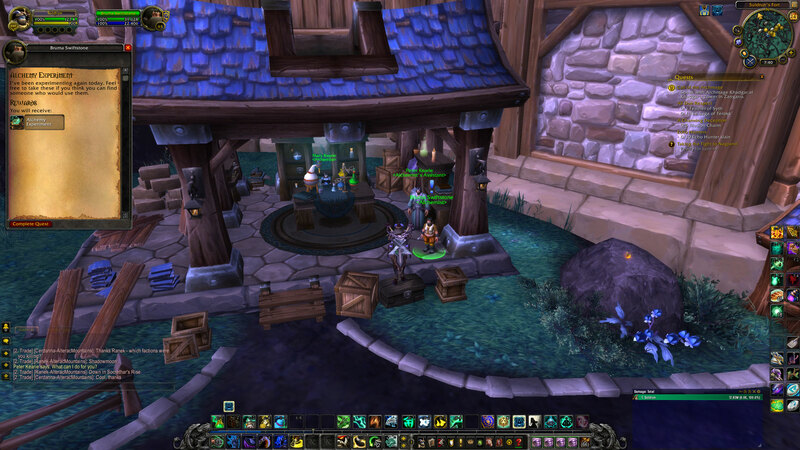 It provides a few mins of easy tinkering before getting ready to quest out in Draenor. It’s a nice feature and Blizzard can really some cool stuff to its mechanics in future expansions.